How do you tell parents to expect less from their children? 1. What is the probability of rolling a one (using a regular six-sided cube)? 2. If you flipped a coin, would you expect it to come up heads? 3. 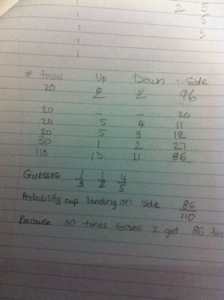 What is the probability that a paper cup tossed in the air will land on its side? Several other students chimed in in agreement. Me: who can tell me how you can be so sure? 2 Ss: because the cube has six sides, and the sides are numbered one, two, three, four, (she is ticking off on her fingers; other students were nodding in agreement and telling her what to say) five, six, and there is only one side with one! 1 Ss: yes, well, no, (???) it could be heads or tails. I mean, you could expect a heads or a tails. Me: why can’t you expect just heads? “Yeah, it’s 1/2!” “A coin has two sides” and similar statements.) The question wasn’t a straightforward question about a probability fraction, so I think that caused them to not feel as confident with the answer, until one student decoded it. Think: lemmings! 1. Compare the actual probability from the trials to the expected. 2. Come up with some reasons for the difference. 3. Pick a spokesperson to share their ideas with the class. “It is not as important that managers have succeeded with the problem as it is for them to have wrestled with it and developed the skills and intuition for how to meet the challenge successfully the next time around” The Innovator’s Solution: Creating and Sustaining Successful Growth Clayton M. Christensen, Michael E. Raynor The above quote applies to hiring good people to help businesses grow and succeed. I could change the word ‘manager’ to ‘student’ and define exactly what the career ready student must look like! Good companies know they will never find a perfect experience match, but instead will look for skills that allow the transfer of abilities. In math having the students actually work at solving math challenges will give them those transferable skills – and the confidence to use them! What does this process look like during an actual lesson? The initial introduction to this problem-solving task ‘stuff’ might present a challenge for both you and your classroom. It did for mine. 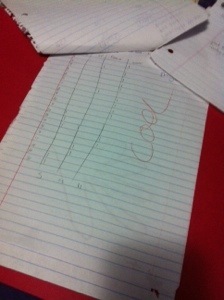 I was following the pattern of ‘tell students the goal of the lesson’ (i.e. factor polynomials); run through the lesson with questions and discovery (felt like pulling teeth! ), work problems with them; give them practice. My frustration was in the students’ comprehension- I could tell with my questioning that they didn’t ‘get it.’ ” Why don’t you just tell us?” one student even said. There was no desire to look for possible solutions. they just wanted me to give them the answers and accused me of not teaching them. The frustration on all sides stopped the learning process. I was asking them to do something they didn’t have the tools to do. I failed to train them in the method I wanted them to use! I’m here to keep you from making the same mistakes I did. Lay the groundwork first with mathematical thinking. Then get out of the way and be less helpful! Be Less Helpful I first heard this phrase while watching a TED talk by Dan Meyer. The genius of his approach, letting students look at a situation and decide how to solve it, was breathtakingly simple. It pinged deeply against what I was beginning to learn about in the common core ‘key task’ ideas. It fit in with my own ‘questioning and discovery’ method. I had to know more. What I found was a community (blogs and on Twitter!) of teachers who are committed to teaching their students through challenging tasks, and giving the students lessons as the child decides they need the skill to solve the assignment!” The difference? Nobody asks, “When am I ever going to use this?” They are putting their hands out for the teaching. They are engaged and interested because they are in charge of the process. The key to success is in choosing tasks that are going to teach the standards you want them to learn. Here is a good checklist for the tasks you want to use: 1. 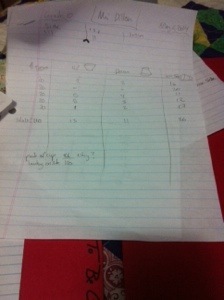 Identify the mathematical goals for the task: what standards will the students experience as they solve this task? 2. Identify how prior knowledge will be scaffolded. 3. Identify how students will demonstrate that the mathematical goals have been met. 4. Work the task in order to anticipate possible solution paths; ensure a variety of representations and/or strategies. 5. Identify common misconceptions. In other words- everything you always do for a lesson! Here is the difference: you are not going to tell them how to solve the task, or what methods or formulas to use. you are not going to remind them of where they have already seen the material or tell them how to start thinking about the task. You may or may not provide an illustration- the following task requires they visualize the triangle themselves. This is not the time for remediation lessons for kids missing skills. Let them struggle. As much as you want to give in and tell them what to do, don’t. Ramp up the questions to help the student find the entry point that fits their skill level. No, they may not get as far as the rest of the class today, but they will be further along than when they started! The task allows students to explore, investigate, and make sense of mathematical ideas on their own. Let it provide personal challenge and productive disequilibrium, too. Be less helpful! Here is an example of a key task: Teaching the Converse of the Pythagorean Theorem Students are told to envision a triangle, sides a,b,c, where side c is a specific given length. The task is to use various lengths for sides a, b and determine what effect the lengths have on angle C. (You may specify that sides a, b must be shorter than C, as an introductory exploration, but that is all.) As you go around the room, looking on as students individually engage the task, remember that you are not allowed to tell anyone where to begin. You should be ready to ask prompting questions (prepared beforehand) to give students ideas about entry points if they can’t get started. Have advancing ideas for students who get done quickly, (ask them to come up with a different method to do what they did, or ask them what happens when a,b are longer and shorter, or longer and longer). During the group work, listen for everyone sharing. Require that students justify and defend their work to the group. Be prepared with clarifying questions. If a student is changing their work because of another student, ask them to tell you what changed their mind- this articulation of ideas is critical. This is a good time to decide on selection and sequencing for the whole group discussion. Your goal here is to assess their learning and advance them toward the mathematical goals using questions (to prompt, to clarify, to restate). The whole group discussion is the opportunity for summarizing the learning from the groups. Encourage every student (I utilize Accountable Talk) to participate, either by sharing ideas, or restating comments from others. This is the place to make connections among solution paths- let the students make the connections (remember, we are being less helpful!) Don’t forget to tie in what they have done to the vocabulary. In the converse lesson, this is the place to tie the mathematics the students have used into one of the three versions of the converse theorem, (and to the standards goals for the lesson). It is important to have another problem or two that require similar (but not exact) engagement for ‘setting’ the skills they just used, and expanding on what they just did. Don’t forget this step. I believe in having students talk about what they have discovered- not to me, but to another student, or in a journal. This would be yet another step in formative assessment for learning. Or, I could have just asked the students to use the Pythagorean Formula, given the measurements for sides a,b,c and asked the whether angle C is 90 degrees. What do you think?